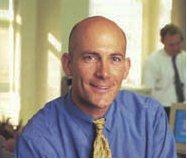 GUEST BLOG: by David Cowen, President & Managing Partner of The Cowen Group. Editor’s Note: David’s company is one of the leading legal technology and eDiscovery staffing firms in the world. The Cowen Group specializes in e-discovery placement for corporations, law firms and vendors helping technologists, project managers, and lawyers find employment. I know my readers will be interested in what David has to say about the job market, especially the salary levels shown in his recently completed 7th Annual Salary Survey. In many ways, 2012 mirrored 2011 in the development of Litigation Support and eDiscovery talent. Demand for talent remained moderate to strong throughout 2012, while salary ranges remained relatively flat, experiencing modest cost of living adjustments of 3 to 5 percent in base compensation. For example, the median salary for a Firm-wide Director increased from $230,000 to $245,000 and the median salary for a Firm-wide Manager increased from $138,000 to $150,000. Over 60% of Firm-wide managers predicted they would receive an increase in their bonuses in 2013. Chart from pg. 5 of the Cowen 2012 Annual Salary Survey. The Survey identified four critical trends in 2012 that we think will affect the demand for talent in 2013. Large firms with a strategic focus on providing eDiscovery services to their clients pay significantly more than mid-market firms. Moving to fill an urgent need at an established department can increase salaries by $15,000 to $50,000. Large firms with a less established eDiscovery service offering are recruiting Senior Attorneys and Partners to develop a market leading practice area with staff attorneys, internal Litigation Support teams, and a network of strategic partnerships. More law firms are anticipating adding talent. 70% reported plans to hire in 2013, up from 53% in 2012, and 60% in 2011. Salary growth is higher – firms were more likely to report raises of 5% to 7% range, where in prior years raises were in the 3% to 4% range. As forecasted by our 2011 Salary Survey and Market Landscape, staff expansion continued at large established firms with sophisticated litigation support departments, broad client support and executive leadership. A handful of firms took strategic steps to modernize their litigation support offering and increase the capacity and capabilities of their teams. The majority of the market continued to make replacement hires or modest additions to their staffs where necessary. 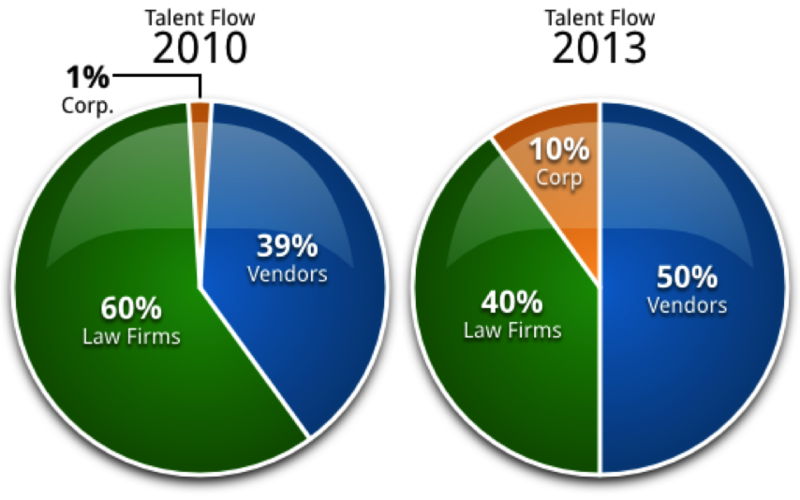 These replacement hires were driven by the shift the industry continues to experience in the flow of talent from law firms to vendors and corporations. Throughout our Leadership Breakfast series and research efforts in 2012, the eDiscovery community (executives from the AmLaw 200 and Fortune 500 legal departments) remarked on the increase of corporate control, heightened regulatory requirements and enforcement actions at a state and federal level, the rise of managed services, and the small but significant amount of law firms building their own internal vendor as contributing factors for the shift in talent. These drivers will most likely continue to put competitive pressure on law firm service models and hiring plans extending and increasing the talent flow between firms, vendors and corporations in 2013. After 6 years of “do more with less” initiatives, major corporations in financial, pharmaceutical, and oil & gas industries are finally investing in experienced talent. As the creation of ESI at these highly regulated companies and serial litigants continues to grow exponentially, the need to hire experienced professionals who understand the management and disposition of electronic data in an investigation context is increasingly more critical. 2012 was the biggest year for corporations to invest in talent to date. Corporations who are investing are looking for both eDiscovery managers and experienced senior project managers with experience at an AmLaw 100 firm or a top service provider. These qualified candidates have experience in developing processes and workflow, managing operations and junior staff, executing projects, engaging outside counsel, managing vendors, establishing and tracking metrics, and consulting with various internal stakeholders within the organization. These new corporate manager roles are primarily tactical and operational not strategic. In the majority of corporations, strategic work is still being done by outside counsel, consultants or paralegals reporting into the Office of the General Counsel. Furthering the need for hiring talent at a corporate level, 2012 has seen a significant increase in new federal and state regulations and regulatory enforcement actions. A good example of this for the financial sector is The Dodd-Frank Wall Street Reform and Consumer Protection Act of 2009. These standards require enormous new reporting and accountability measures, which corporations have begun to implement in the past 12 to 18 months. This expanding demand for reporting requires financial services firms to dig deep into data that is not easily accessible, thereby driving demand for new professionals that can identify, preserve, collect, and analyze the information to feed the required reports. The Dodd-Frank Act and other strengthened regulatory oversight will be one of the triggers (along with information security, data privacy concerns, and a global mobile workforce) that accelerate the convergence of compliance, information governance and eDiscovery. This convergence creates a demand for a specialized professional much in the same way the FRCP changes of 2006 were the trigger that drove the demand for talent in our current eDiscovery space. This shift will expand the demand for information strategy counsel creating new and evolving legal roles within law firms as well. The Cowen Group projects 75 new corporate eDiscovery positions will be created in 2013. Ten of the AmLaw 200 made the decision to outsource significant portions of their litigation support department in 2012 and 40 more are expected to do so in 2013. This dramatic increase in new business created an immediate need for vendors to hire experienced analysts and project managers with major law firm experience, technical aptitude, and superior communication skills. Service providers in major growth mode were willing to pay 15 to 25 percent above market value to capture this top talent. On the opposite end of the scale, the small but focused trend of specific AmLaw 100 firms building their own internal vendors, with well-defined career paths and correspondingly elevated compensation packages has added to the shortage of top talent in the market. The Cowen Group expects this trend to continue throughout 2013 and into 2014. 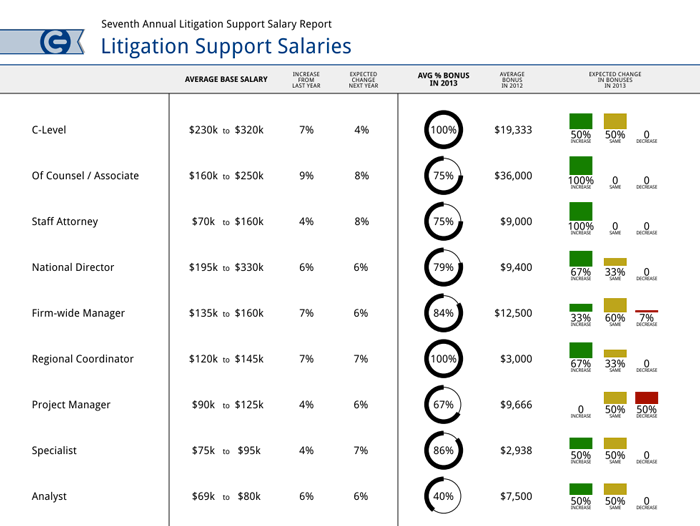 The shortage of experienced project managers and analysts along with the shift of talent to corporate positions, the complexity of litigation support technology, and the massive volume and variety of data will be one of the reasons why many law firms choose to outsource pieces of their litigation support department in 2013. As firms reinvent their litigation support delivery model, more general technical roles will begin to disappear and the demand for sophisticated and experienced talent that can engage and consult will increase. High margin project managers and eDiscovery Associates will rise, and we expect several new roles to be created in 2013. Basic project management experience is no longer enough. Project managers in 2013 will need to be experienced, competent, business and technically savvy, and most of all have superior written and verbal communication skills with the proven ability/competency to manage up, down and out. Formal project management training will be more in demand than ever. The second important trend to watch in the AmLaw space is the demand for eDiscovery practice group attorneys, counsel and associates. In 2010, The Cowen Group released our first report, The Current State: eDiscovery Practice Groups at AmLaw 200 Firms, where we noted 87 firms had an area or practice group dedicated to handling eDiscovery matters and 43% of those surveyed had one or more attorneys dedicated exclusively to the group. Although no hard data is available, our best projection is that more than 25 of these positions were created in 2012 and the number will double in 2013. The role of the eDiscovery Practice Group attorney will evolve over the next 12 to 24 months with firms further investing in attorneys who can not only consult with clients and have billable hours but also manage a litigation support team. This combination of legalist, technologist and business manager will be a key ingredient for growing eDiscovery Practice Groups. This new role will displace many of the old school litigation support managers similar to how current managers displaced copy/scan managers in the 1990s. The Cowen Group will include a question around this demand for eDiscovery Practice Group attorneys in our 2nd Quarter Critical Trends Survey which will be conducted in June of this year. In addition, we will be asking firms about their investment in information governance talent. These roles are becoming essential in law firms as more corporate clients begin to see a convergence of eDiscovery and information governance in their organizations. Vendors are creating new positions faster than any other segment of the market and will continue to do so at an accelerated rate in 2013. This will put additional upward pressure on litigation support salaries and compensation in 2013. In order to be competitive and gain further market advantage, forward thinking and ambitious vendors will create a more corporatized work environment, better training and career management for their employees. Thus increasing their ability to hire and retain the best and the brightest. The Cowen Group projects 175 new eDiscovery positions will be created at vendors in 2013. As these vendors gain momentum and market share, they will develop even better training programs for new new talent. What happens after what happens next? you may ask. From where I am sitting the rate of change in the eDiscovery industry is faster than most think. Data volumes are increasing and technology is evolving rapidly leaving you with ever-increasing career opportunities in the eDiscovery marketplace. So here’s the payoff and the inspiration you have been waiting for. Whether you are a legalistic, technologist or project manager, executive or practice group partner your future looks remarkably promising right now. But you need to be an active participant in your own career advancement and acceleration. Invest in educating yourself around the newest technologies and services our industry offers. Seek the right certifications for your career such as Relativity Administrator, Lean Sigma or Project Manager Professional. Take time to read the latest articles and blogs written by professionals in eDiscovery but also read business books that will help your career acceleration. If you haven’t read them already, I suggest you place The Innovator’s Dilemma by Clayton Christiansen and Tomorrow’s Lawyers by Richard Susskind at the top of your list today. Both of these reads are macro-economic in their approach and lay out a framework of thinking that you will recognize and be able to utilize immediately. Finally, network and build valuable relationships. Find the right mentors and sponsors. I’m talking about the white knights that have propelled their careers by knowing what happens after what happens next and who will provide you with the right guidance to move your career to the next level. What happens after what happens next is now completely up to you. This entry was posted on Sunday, February 17th, 2013 at 8:30 pm and is filed under Evidence, Forensic Exam, Lawyers Duties, Metadata, New Rules, Related Legal Webs, Review, Search, Spoliation/Sanctions, Technology. You can follow any responses to this entry through the RSS 2.0 feed. Both comments and pings are currently closed.